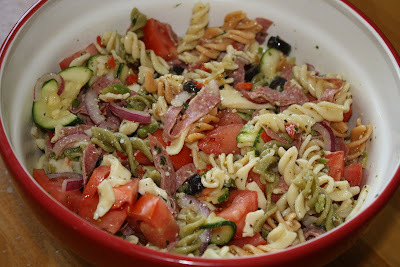 With summer so close I can almost taste it, I thought I'd make a summer salad...a pasta salad to be exact. Cook pasta according to package directions; rinse in cold water and drain. In a large bowl add pasta and next 9 ingredients. In a jar with a tight fitting lid, combine oil, vinegar, garlic, mustard, basil, oregano, salt & pepper; shake well. Pour over salad; toss to coat. Cover and chill for 8 hours or overnight. Toss before serving. Garnish with tomatoes. Don't let the long list of ingredients scare you. It's not that many ingredients and it's a snap to put together. Pull up a chair, grab a bowl and enjoy! 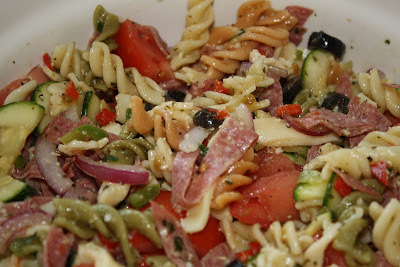 I have made salad like this...it's great yours is a little different. Yumola Gina...your salad looks gooood. Thanks a lot, now I'm hungry :-) Hee, hee, hee. 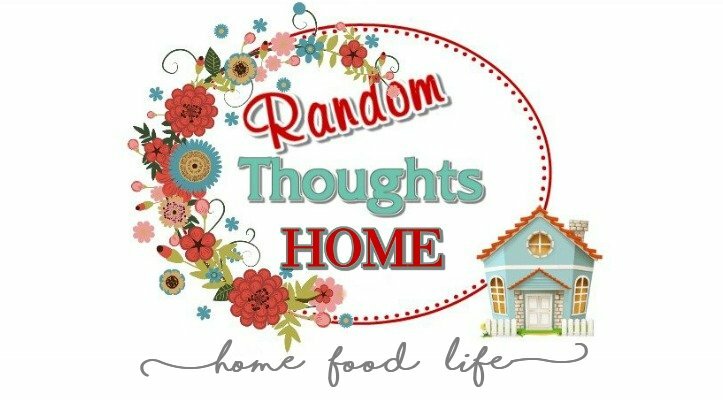 Thank you for sharing the recipe...Have a wonderful day my friend and here's hoping for beautiful sunny days for the both of us. Sooner than later, I hope...NO MORE JUNE GLOOM!